Intel's next generation "Ice Lake" processor could integrate a significantly faster integrated graphics solution (iGPU), if a SiSoft SANDRA online database entry is to be believed. A prototype "Ice Lake" chip was benchmarked, with its iGPU being described by the database as "Intel UHD Graphics" based on the company's Gen 11 graphics architecture, which succeeds the current Gen 9.5 architecture implemented on "Coffee Lake" and "Kaby Lake." This iGPU is endowed with 48 execution units (EUs), which work out to 384 unified shaders; against 24 EUs and 192 shaders on Intel UHD 620. SANDRA also describes the iGPU as being able to share up to 6 GB of memory from the system memory; and featuring 768 KB of dedicated cache. Its reference clock is 600 MHz, double that of the UHD 620, although its boost clock remains a mystery. "Ice Lake" is being built on Intel's new 10 nm+ silicon fabrication process, so it's understandable for the company to significantly enlarge its iGPU. When is Z390 and the 8cores supposed to come out? It's an improvement, but they are still (~5) years behind compared to the other 2 competitors when it comes to graphics. And what's funnier, NO ONE wants it. They keep wasting die space and power on it. Keep the low end crap for OEM CPUs and let the big boys play. They'll never get it. I'm gonna call them Cisco. They are not competing for the same thing. Intel integrated video is practically in every Intel mainstream computer out there. As far as performance goes, Intel's graphics are really not that bad. They are just small and somewhat underpowered. A version twice the size would be interesting to see. Drivers and compatibility is quite well figured out, there are no major issue with that any more. And what's funnier, NO ONE wants it. Actually, I would say this is non-news. GT3e has been 48 EU since Broadwell and Haswell GT3 had 40 EU. We will see if the new generation makes a difference, probably not. Yes, no one wants Intel's lol. Even if bigger, it's still going to be unsupported in games with shady drivers. RAM is still too big of a limitation, though, regardless. I have not had compatibility issues with Intel Graphics drivers for years now. Low performance - sure. But not issues with unsupported games or shady drivers. Did they fix opengl? I assume they haven't. By unsupported, I mean good luck getting any fixes should a problem arise. It's all moot to me as they're only good for low power or media PC. Who are talking about games? It's not being gamed at like 90% of the worlds computers that doesn't see a game. Yes we want igp, before our laptops had additional 15w low end gpu guzzling power in our laptops and still wasn't capable of doing anything the igp solutions that came couldn't it just took valuable battery time. There is only one other competitor when it comes to integrated graphics. What do you mean no one wants it? Raven Ridge has gathered quite a lot of positive feedback and with good reason. That's because on Raven Ridge you can actually play some modern games. They're actually changing their iGPU? I nearly gave up hope, but here they are designing a GOOD one! Nice! I forgot about the high-end ones. Maybe they're just repurposing old iGPU designs on a better wafer then. As far as performance goes, Intel's graphics are really not that bad. They are just small and somewhat underpowered. They aren't small at all , they occupy nearly half of the die. There is no beating around the bush , Intel's integrated graphics are horrible. I often wonder why they don't just get a licence from ARM and be done with it. Improvement to what? 384 ALUs / 48 EUs matches GT3 level (=Iris, Iris Plus) on current Intel IGP graphics and there's also GT4 level (Iris Pro) which has 576 ALUs / 72 EUs. So, Iris is going to stop being niche-only? 1/3-ish. That includes all the media and display stuff. Why exactly are Intel's integrated graphics horrible? They are slow and use too much space that could otherwise be used for wider cores or more of them. I wouldn't mind them putting basic display adapter functionalities in their chips but as of now they are sacrificing way too much for something that barley is a bit more than a display adapter. The aforementioned ARM GPUs are light years ahead of them. They keep complicating their GPUs for things like compute since they are losing ground to Nvidia in the datacenter space. But the result is a cluterfuck of a chip than provides no real advatage over their competitors. 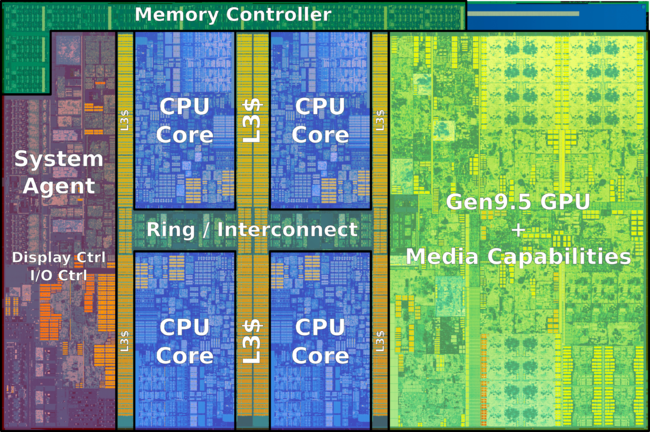 Did you know Intel has , ironically , the most efficient hardware for geometry shaders ? Geometry shaders are avoided like the plague by graphics programmers. Why are they wasting time developing these things if no one uses them ? $99 2200G APU, MSI A320M mobo for $44, $34 after rebate. and one cheap stick of 8gb ddr4 ram at low speeds, but it won't matter to her. and i re-used an old PC case, an ancient PSU I had from like 8 years ago, and yeah... it came with its own really nice heatsink... so I mean not so bad really. especially since I can share my steam library with her since she lives with me and my parents. = she is set for awhile at least for very old games.